A CAREER-high 15 assists as part of a triple-double from Ben Simmons wasn't enough for the Philadelphia 76ers as they slumped to an embarrassing 123-121 home loss to the lowly Atlanta Hawks. 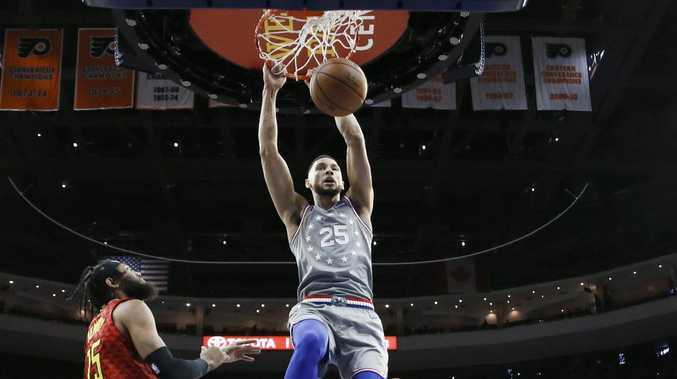 With Joel Embiid rested for the match it was up to Simmons, Jimmy Butler and returning guard JJ Redick to get the 76ers home but they ultimately came up short as the Hawks, led by rookie guard Keven Huerder, took a last-minute win. Huerder dropped a career-high 29 points and five of eight three-pointers to help sink the 76ers, rendering some delightful play from Simmons obsolete. The Australian did all he could with 23 points and 10 rebounds to go with his 15 assists, three of which came in the last four minutes of the game, including one delightful dish to find Butler above the rim for an alley-oop. Still his vision wasn't enough and with nine seconds left on the clock, Atlanta forward John Collins made a tough two-point jumper to give the Hawks the lead. Off the timeout the 76ers drew up a play for Butler (30 points), who was fouled at the rim. Until then Butler had been perfect from the line with 12-12 free throws, but he missed the pair and Tyson Chandler missed a tip-in chance as the 76ers fell to a second straight loss, after being flogged by the Washington Wizards just two days ago. Speaking after the match, Simmons said his team was "too soft". "I just don't think we're physical enough," he said. "Defensively it should be a pride thing. "It has to be a pride thing. We should take it personally if someone scores on us." For Atlanta, Huerder was helped by 25 points from Collins and 19 from centre Dewayne Dedmon.